O.G. Rejlander visited the Isle of Wight in the early 1860s, photographing members of the Tennyson and Cameron households. 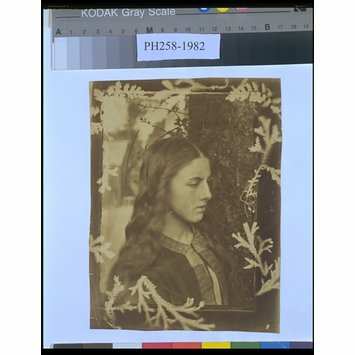 It is believed that Julia Margaret Cameron either worked in collaboration with Rejlander and/or printed this work. 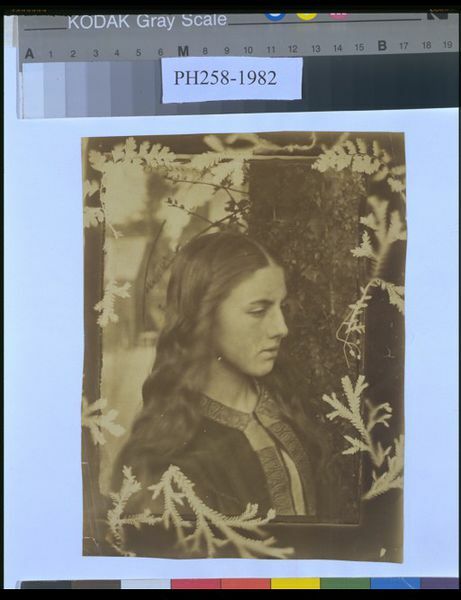 To do so, Cameron placed ferns between the paper and one of Rejlander’s negatives. The ferns printed as white, forming a frame around the portrait. It shows Cameron’s experimental nature and provides a glimpse of her photographic practice before she acquired a camera. A photograph of a young woman (Kate Dore) taken in 3/4 profile, her hair is loose. The edges of the photograph have images of ferns produced using the photogram technique. This print is a photogram, a technique of making a picture without a camera or lens. Photograms are made by placing objects on top of a piece of photographic paper and then exposing the composition to light. 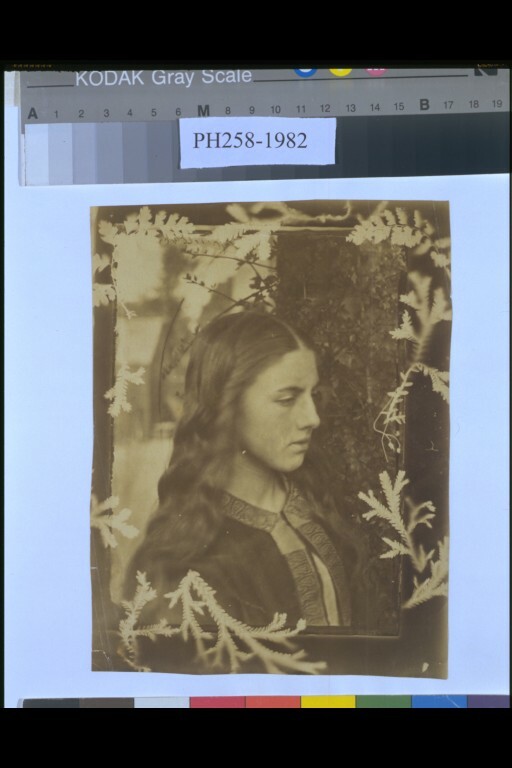 In this example, ferns were placed in contact with the glass negative prior to printing-out in sunlight. This appears to be unique in Cameron's oeuvre, as she did not use photogram techniques elsewhere in her work. However, it is typical of her iconoclastic and experimental methods. She embellished a portrait, known to be by Oscar Rejlander, by placing ferns between the negative and the printing paper. The ferns, printing as white, perhaps symbolise the delicate sensibility of the young woman, and perhaps her 'naturalness'. O.G. Rejlander visited the Isle of Wight in the early 1860s, photographing members of the Tennyson and Cameron households. To make this print, Cameron placed ferns between the paper and one of Rejlander’s negatives. The ferns printed as white, forming a frame around the portrait. It shows Cameron’s experimental nature and provides a glimpse of her photographic practice before she acquired a camera.